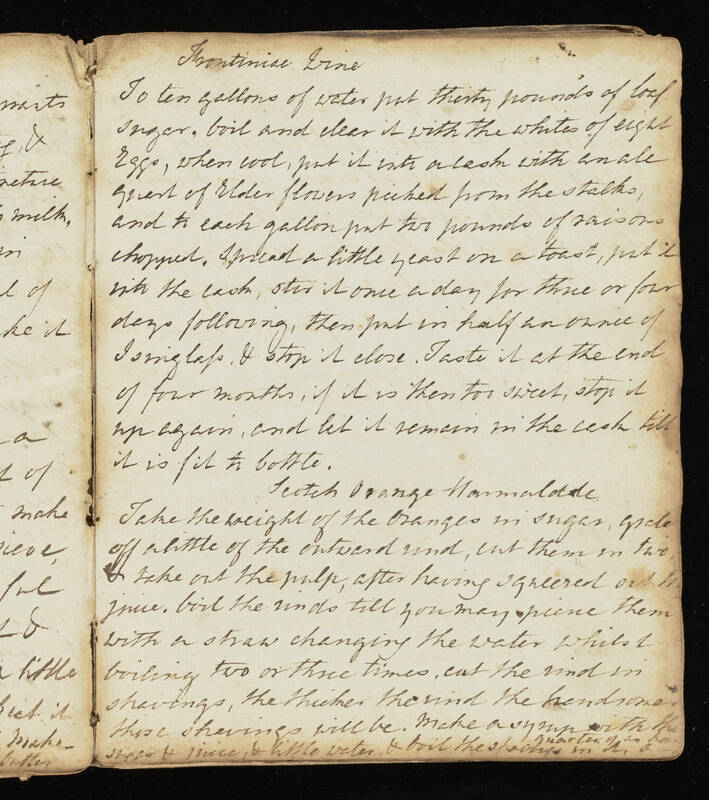 [illegible] Brine To ten gallons of water put thirty pounds of loaf sugar, boil and clear it with the whites of eight eggs, when cool, but it into an [illegible] [illegible] of elder flours picked from the stalks, and to each gallon put two pounds of raisins chopped. Spread a little yeast on a toast, put it into the cask, stir it once a day for three or four days following, then put in half an ounce of [Issinglap? ], & stop it close. Taste it at the end of four months, it it is then too sweet, stop it up again, and let it remain in the cask until it is fit to bottle. Scotch Orange Marmalade Take the weight of the oranges in sugar, grate off a little of the outward rind, cut them in two & take out the pulp, after having squeezed out the juice. boil the rinds till you may pierce them with a straw changing the water whilst boiling two or three times. cut the rind in shavings, the thicker the rind the handsomer these shavings will be. Make a syrup with the sugar & juice, & little water, & boil the shaving in it quarter of an hour.